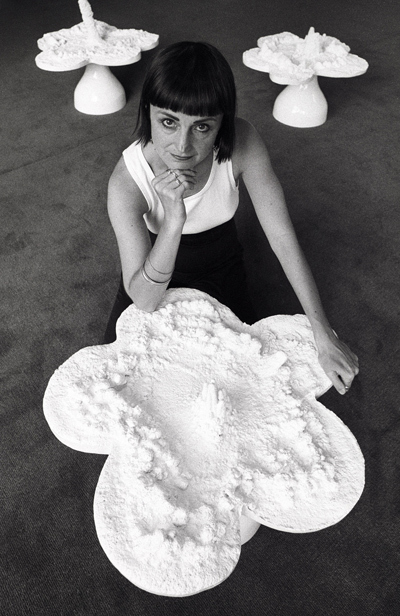 British conceptual artist Helen Chadwick embraced the sensuous aspects of the natural world, breaking taboos of the "normal" and "traditional" in art historical pedagogy. Her influence upon a young generation of British artists was cemented through her teaching posts at the Royal College of Art, Chelsea School of Art and the London Institute. Her experiments with material were innovative and unconventional and captured a world in a state of flux. Piss Flowers (1991-92), in which she cast the interior spaces left in the snow by warm urine, are at once revulsive as they are beautiful, and it this combination that typifies Chadwick's work: aesthetic beauty created out of an alliance of unconventional, often vile, materials. Nominated for the Turner Prize in 1987 her work is included in the Tate Collection as well as the collections of the Victoria & Albert Museum and the Museum of Modern Art, NY. For all sales and museum enquiries, please contact Richard Saltoun Gallery.